Follow me here. In Canada last month, February 2013, the Audi A5 outsold the Volkswagen Beetle, a distant relation, by seven units. The Beetle, now available in hardtop and convertible bodystyles, outsold the combined efforts of the Scion FR-S and Subaru BRZ by one unit. The FR-S, meanwhile, outsold the Chevrolet Camaro and Dodge Challenger, but not the Ford Mustang. Together, the Mustang, Camaro, and Challenger outsold the BMW 1-Series by only four units. 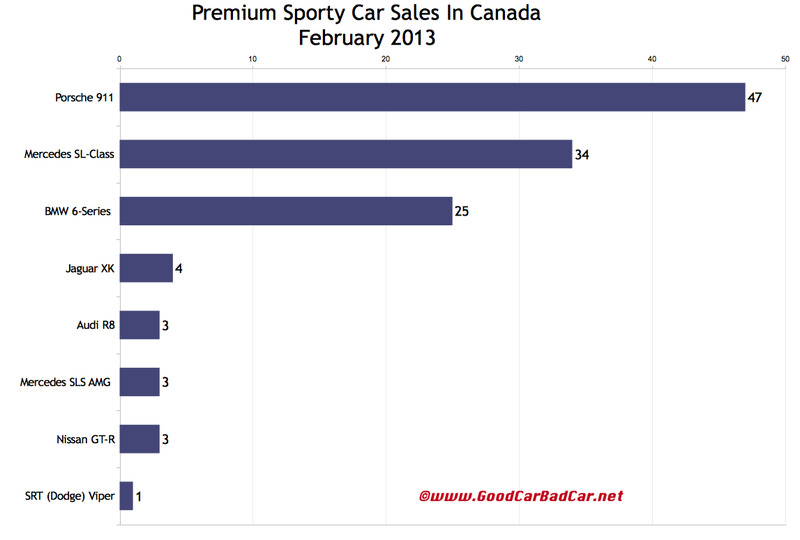 For every 83 1-Series coupes and convertibles that left BMW Canada’s showrooms in February, one BMW Z4 found a home. Z4 sales were 50% stronger in February than in January, but the Mercedes-Benz SLK sold 4.6 times more often, the Audi TT 5.3 times more often, and the Porsche Boxster eight times more often. In fact, the Boxster and its hardtop Cayman sibling outsold the plunging Nissan 370Z by a 3.6-to-1 count. Porsche’s own 911, the more expensive; more profitable; more famous 911, was very nearly twice as popular in February than the Boxster. The 911 found 47 buyers. Put together, the Audi R8, Jaguar XK, Mercedes-Benz SLS AMG, Nissan GT-R, and Dodge… er, SRT Viper only sold 33 copies. 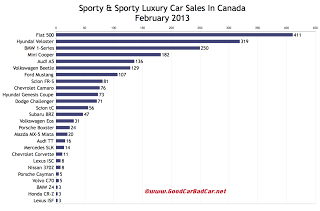 That’s all fine and well in a Canadian winter, but doth it not show the dominance of Porsche’s evocative sports car? It doth, indeed. At the opposite end of the European car scene, the Fiat 500 and Mini Cooper – which like the 911 don’t look much different than they did four decades ago – suffered severe declines both in January and February. They certainly won’t the only cars featuring red font in the accompanying lists. 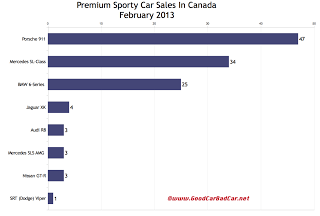 Canada’s automobile industry was down 3.3% in February. Cars of all types contributed to the decline. The two tables you see here are sortable, so you can rank the cars five different ways: by volume, year-to-date volume, by year-over-year change, year-over-year change on a two-month scale, or alphabetically. Feel free to offer suggestions on how you’d like to see GoodCarBadCar break down sporting car segments in the future.